Seacoast United is extremely excited to welcome Caitlyn Smith as our newest full-time field hockey staff member. A native of Greenland, NH, Caitlyn attended Portsmouth High School, where she captained the varsity field hockey team her senior year. After graduation, she attended Sacred Heart University, where she played field hockey for two years. After two seasons for the Pioneer’s, Caitlyn transferred to UNH, where she completed her degree in Psychology. 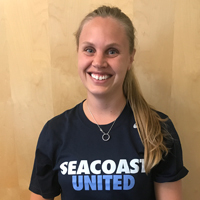 As a member of the inaugural Seacoast United Field Hockey Club team in 1999, Caitlyn was thrilled to join our part-time coaching staff in 2008, while finishing her degree at UNH. Through her time with the club, she has been very involved with not only our club teams, but also our skills classes, summer camps and leagues. She has experience coaching all age groups, and more recently began overseeing our SUFH Capitols location. This will be the second year offering club teams in Concord, and we could not be more happy that Caitlyn will be the Program Director for this site. With the addition of Caitlyn, our field hockey program now has five full-time staff members. We look forward to the year ahead, while we continue to expand our footprint in New England!